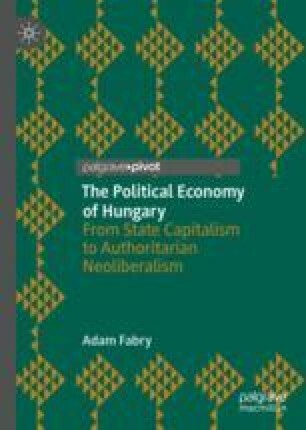 This chapter adumbrates the main argument of the monograph: that the contradictory and variegated development of Hungary’s political economy from the transition in the early 1980s to the consolidation of ‘authoritarian-ethnicist neoliberalism’ under Viktor Orbán’s premiership cannot be understood as a sui generis process, but rather needs to be conceived in relation to the neoliberal restructuring of the capitalist world economy since the mid-1970s to the present. Bowman, S. (2016, October 11). Coming Out as Neoliberals. Adam Smith Institute. Retrieved June 7, 2018, from https://www.adamsmith.org/blog/coming-out-as-neoliberals. Bremmer, I. (2018). The “Strongmen Era” is Here. Here’s What It Means for You. Time. Retrieved May 5, 2018, from http://time.com/5264170/the-strongmen-era-is-here-heres-what-it-means-for-you. Pirie, M. (2014, August 20). Looking at the World through Neo-liberal Eyes. Adam Smith Institute. Retrieved June 7, 2018, from https://www.adamsmith.org/blog/thinkpieces/looking-at-the-world-through-neo-liberal-eyes-2.